NASHVILLE, Tenn. – When it comes to Halloween, most Americans don’t have a problem celebrating the spooky holiday. Yet, one-third say they avoid Halloween or its pagan elements. 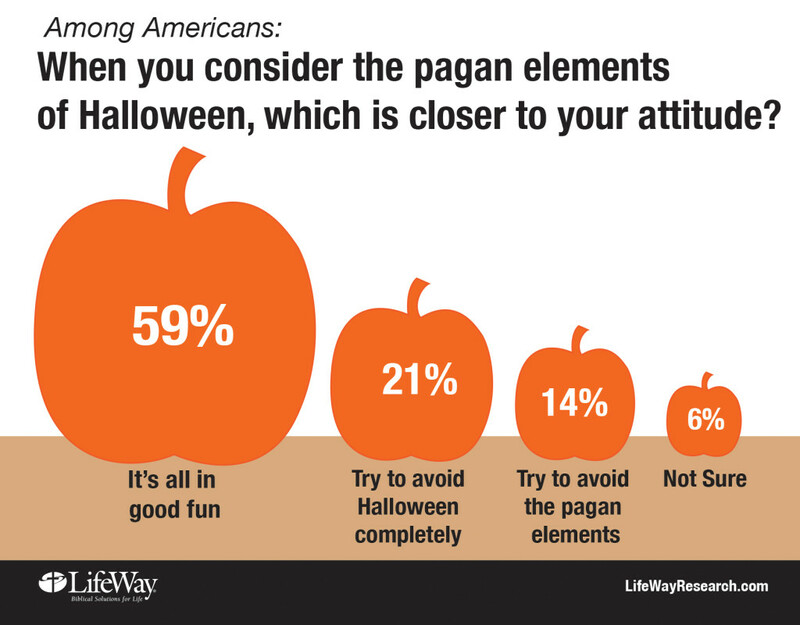 Although 3 in 5 Americans told LifeWay Research Halloween is “all in good fun,” 21 percent avoid the holiday completely and another 14 percent avoid the pagan elements. Halloween has been known in North America since colonial days. But it wasn’t until Irish immigrants brought their Halloween customs to America in the 1840s the festival grew in popularity. Since then, it has been woven into the fabric of American culture. By the 1950s, Halloween was mostly considered a children’s holiday celebrated with costumes and candy. But Halloween has exploded in popularity the last several years, even among adults. Americans are expected to spend $6.9 billion on Halloween this year, according to the National Retail Federation, more than double the amount spent 10 years ago. “As popular and pervasive as Halloween has become, there is still a sizeable minority that avoids at least some elements,” said Scott McConnell, vice president of Nashville-based LifeWay Research. Not surprisingly, nonreligious Americans are most likely to say Halloween is all in good fun (75 percent) and least likely to avoid Halloween completely (11 percent), according to LifeWay Research. Christians aren’t far off from the rest of Americans when it comes to Halloween. A slight majority (54 percent) says Halloween is all in good fun, while 18 percent try to avoid the pagan elements, and 23 percent avoid it completely. Catholics are more likely to select “It’s all in good fun” (71 percent) than Protestants (49 Percent). Church attendance also affects Americans’ views of Halloween. Those attending a religious service once a week or more are the least likely to say Halloween is all in good fun (44 percent), compared to those attending once or twice a month (68 percent) or only on religious holidays (82 percent). “More than two-thirds of evangelicals welcome the candy, costumes, or community interaction surrounding the holiday, but the majority are unwilling to label ‘the pagan elements of Halloween’ good.” McConnell said. Americans are separated by geography as well as age when it comes to attitudes toward Halloween. Southerners (27 percent) are more likely than those in the West (19 percent), Midwest (18 percent) and Northeast (12 percent) to say they try to avoid Halloween completely. Older Americans are also more likely to avoid Halloween than their younger counterparts. Those age 55 and older (27 percent) are more likely to select “I try to avoid Halloween completely” than those age 18-54 (17 percent). Carol Pipes is editor of Facts & Trends magazine. Methodology: The phone survey of Americans was conducted Sept. 14-28, 2015. The calling utilized Random Digit Dialing. Fifty percent of completes were among landlines and 50 percent were among cell phones. Maximum quotas and slight weights were used for gender, region, age, ethnicity, and education to more accurately reflect the population. The completed sample is 1,000 surveys. The sample provides 95 percent confidence that the sampling error does not exceed plus or minus 3.6 percent. Margins of error are higher in sub-groups.